Megan Proulx said that getting to meet her scholarship donors, Pete and Kristina Riepe, was a wonderful experience. Posted February 6, 2019 – After hearing her mom talk about her years as a kindergarten teacher, Megan Proulx knew she wanted to make a similar contribution to society. To that end, Proulx joined the Peer Assistance Leadership team in high school, where she tutored elementary school students, as well as volunteered with the Special Olympics through the school district. 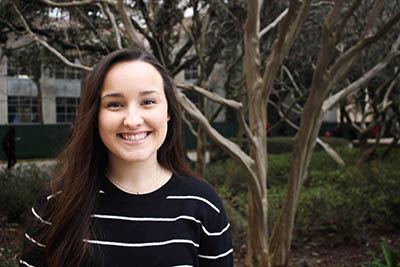 Proulx, now a senior teaching major at the University of Houston College of Education, also serves as vice president of intellectual development for Alpha Chi Omega sorority. She previously was on the Cougar Dolls Dance Team and participated with Love Your Melon, a nonprofit that provided hats to pediatric cancer patients. This year Proulx became the second recipient of the Pete (’00) and Kristina (’01) Riepe Scholarship, established in 2017 to support a College of Education major in his or her junior or senior year. Proulx, who’s set to graduate in May, took a moment to answer some questions. Q: Why did you choose the UH College of Education? A: The university is close to home, which allowed me to live at home. I also recognize the great job opportunities to teach in the Houston area after I graduate. There are numerous school districts to choose among. Q: What’s the best part of the College of Education? A: Professors are there for you and have been through what their students experience. They are able to provide practical experience beyond pedagogical content. Q: What’s your favorite course? A: I enjoyed Curriculum & Instruction. Though it was a strenuous, year-long course, I appreciate learning to develop lessons plans and learning how to teach. Dr. Celeste Alba taught the course, and it was amazing learning with her during her first semester teaching in COE. The course challenged me and allowed me to grow professionally. I got through it with an awesome professor. Q: How has the College of Education scholarship helped you? A: I have been so blessed to receive generous scholarships like the Kristina and Pete Riepe Scholarship. Getting to meet and connect with [them] over dinner was also a wonderful experience, and I am so grateful for thoughtful donors like them. This scholarship has helped to lift the burden of expenses during my final year here in the College of Education and put me one step closer to my degree. A: My sorority house and TDECU, cheering on the Cougars to victory! A: I think something that everyone could learn or hear every once in a while is that it’s OK to ask for help and lean on other people for support. So many people, including myself, constantly feel like success comes from being independent. If there is anything college and student teaching has taught me, it’s that friends, family, mentors and everyone in between are there for you – because this life, especially the challenging profession of teaching, wasn’t designed to have to get through it all on your own.